While Carus Thompson has been winning over fans as he supports famous acts such as Dave Damien Rice, Jack Johnson and Dave Matthews he has pretty much remained unheard of in his home country of Australia… a shame when you consider just how talented a musician he really is. The good news though, is you get that feeling though that his new album Caravan might be about to change all that. This is one remarkable brilliant country album that showcases Carus Thompson’s own unique style. “Red Sky” shows just how beautiful a love song can be without being too soppy while the catchy “You Can’t Find Me” will soon win over any listener. Fans of Australian legend Paul Kelly will easily be won over by “Fifteen” and “You Made Me” which are only separated by the best track on the album, “Imperfect Circle” which shows that Thompson is one of the finest country guitarists going around. The chords on “Imperfect Circle” will make most guitarists extremely jealous. 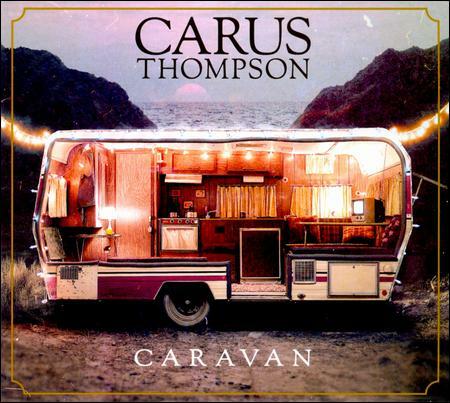 Carus Thompson showcases his amazing voice on “Caravan” and then does what so many artists have tried to do over the years and capture Australia’s beauty in song with “Inland Sea”… good on him for also taking a swipe at city-slickers in the track as well. Thompson then pays tribute to Australian sporting hero, Peter Norman. While many wouldn’t know of Norman, he was the Australian track star who after winning silver at the 1968 Olympics took part in the famous Black Power Salute. Thompson’s tribute to him hear is truly heartfelt and deserving. Once again Thompson produces a beautiful love song with “Beauty is Your Way” and then he captures an amazing bluegrass sound on “I Believe In You”. A trip to the beach this summer is wasted if you don’t have “Headstrong” playing on your stereo (it’s obvious on this track that Thompson has been spending some time with Jack Johnson) while “Whistleblower” sees him slow Caravan down completely. Residents of Ocean’s Grove will also love the heartfelt “Luke’s Song”. Caravan really is an amazing album that sits somewhere between country and folk, but is good enough that it has the potential to win over fans of both genres. His great song-writing ability and brilliant delivery really does make you glad that you discovered his album. Carus Thompson announces himself to Australia and the world with Caravan, an album that is uniquely beautiful. Other Subculture Media ‘Caravan – Carus Thompson’ Reviews: This review of ‘Caravan – Carus Thompson’ by David Griffiths first appeared in Buzz Magazine. Carus Thompson is one of those Aussie artists who has been making a name for himself overseas while people back home have been unaware of what he is achieving. And with just one listen to his new album Caravan it is easy to see why Thompson has one over fans as he supports the likes of Dave Matthews, Damien Rice and Jack Johnson. Caravan is a truly beautiful album and Thompson’s great style should attract more fans to his unique country style. “Red Sky” is a great country love song that shows that love songs don’t have to be all soppy while “You Can’t Find Me” has some great lyrics and is extremely catchy. Both “Fifteen” and “You Made Me” are very Paul Kelly-esque, the former being one of the best tracks on the album. It is only pipped for the ‘Best Song On Album’ gong by “Imperfect Circle” that shows that Thompson is also one hell of a guitarist… it’s chords sound amazing. The title track off Caravan sees the album slow down and Thompson’s great voice is on show for all to hear while “Inland Sea” truly captures Australia’s beauty and rubs it to those who won’t the cities. Thompson returns to his Paul Kelly style of songwriting with “Bright Star” which is a tribute to an Australian Olympian, Peter Norman who took part in the famous Black Power Salute protest at the 1968 Mexico Olympics which saw him shunned by the Australian Olympic Committee until his death. “Beauty Is Your Way” is another beautiful love song while “I Believe In Love” is bluegrass at its best. “Headstrong” announces itself like a light breeze and is the perfect summer beach song while Caravan again slows down for “Whistleblower”. The album then closes with “Luke’s Song”, another great track that sends a shout out to Ocean Grove. It’s not hard to see why Carus Thompson has been winning over fans overseas. With just one listen to Caravan and you’ll be adding yourself to that list of fans.